Xerox Phaser 6010 When best-in-class print speed meets a compact, space-saving design, Xerox makes color the easy choice with the Phaser 6010 color printer. It’s a refreshingly office-friendly printing solution powerful enough to handle your printing demands with ease. Recommended monthly print volume: up to 3,000 pages. Xerox Phaser 6600 With the value-packed Phaser 6600 Color Printer, today’s small workteams can easily make important business communications stand out from the competition with exceptional color printing. Recommended monthly print volume: up to 8,000 pages. Lexmark CS790 Series Easy-to-use touchscreens and available high input capacity makes getting work done even easier. The crisp, vivid colour printing from the Lexmark C790 Series keeps your medium-size office group ready for business. Recommended monthly print volume: 2,500 to 17,000 pages. HP LaserJet Pro 200 Color M251nw The Color LaserJet M251nw is ideal for a small office or desk-side colour printer. It comes with wireless LAN printing which makes it convenient to print from mobile devices. Recommended monthly print volume: up to 1,500 pages. The Color LaserJet CP5225 series can print colour images and text of different sizes and up to 11x17in. It's widely used among engineering firm, design studios, as well as corporate market. Recommended monthly print volume: up to 5,000 pages. HP LaserJet Enterprise Color M551 Series The color laser M551 series is best suited for small to medium size workgroup. Recommended monthly print volume: up to 5,000 pages. HP Color LaserJet CP4025 Series HP Color LaserJet CP4025n CP4025dn are mid-range colour laser printers. They're fast and reliable and are ideal for a Small-Medium size business or a medium size workgroup. Recommended monthly print volume is up to 7,500 pages. HP Color LaserJet Enterprise M651 Series The Color LaserJet M651 series is designed for the enterprise with large workgroups or departments. The M651 can be configured with up to 3,100-sheet input capacity. Recommended monthly print volume: up to 17,000 pages..
(11 x 17) The Color LaserJet M750 series can print documents up to SRA3 (12.6 x 17.72 inch). It's designed for the Enterprise, it supports several operating systems and platforms including SAP. 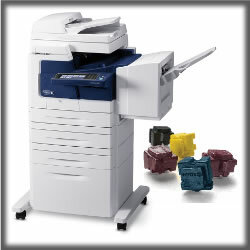 Recommended monthly print volume: up to 13,000 pages..
(11 x 17) The Color LaserJet M855 is designed for the Enterprise. It can sustain high volume printing and it supports several operating systems and platforms including SAP. Recommended monthly print volume: up to 25,000 pages..
HP Color LaserJet Pro MFP M177fw This is a wired and wireless networkable Colour Printer, Copier, Scanner and Fax..It's suitable for single-user or small workgroup. Recommended monthly print volume up to 950-pages. HP Color LaserJet Pro M276nw MFP This is a versatile printer for an executive or small workgroup. It comes with Wireless connection, Touchscreen, in addition to colour printer, scanning, copying, and faxing. Recommended monthly print volume up to 1,500-pages. HP Color LaserJet Pro M476 MFP Series The M476 series come in three models that serve the needs of a small-to-medium size office or workgroup. This is a colour laser printer, copier, scanner and fax that are equipped with Wireless or Wired connections. Recommended monthly print volume up to 2,500-pages.